For older dogs with diabetes (heck, for all dogs with diabetes), dietary control is extremely important. If done right and with insulin replacement therapy, the diabetic dog can live a normal happy life. The goals of dietary control are to deliver the nutrients to the body during periods when exogenous insulin (insulin administered by injections) is active, and to minimize fluctuations in blood sugar levels after meals. If your older dog has diabetes, I assume that your vet has already told you about the importance of a consistent feeding schedule. In this post, I will focus on what ingredients are good for diabetic dog food and treats. 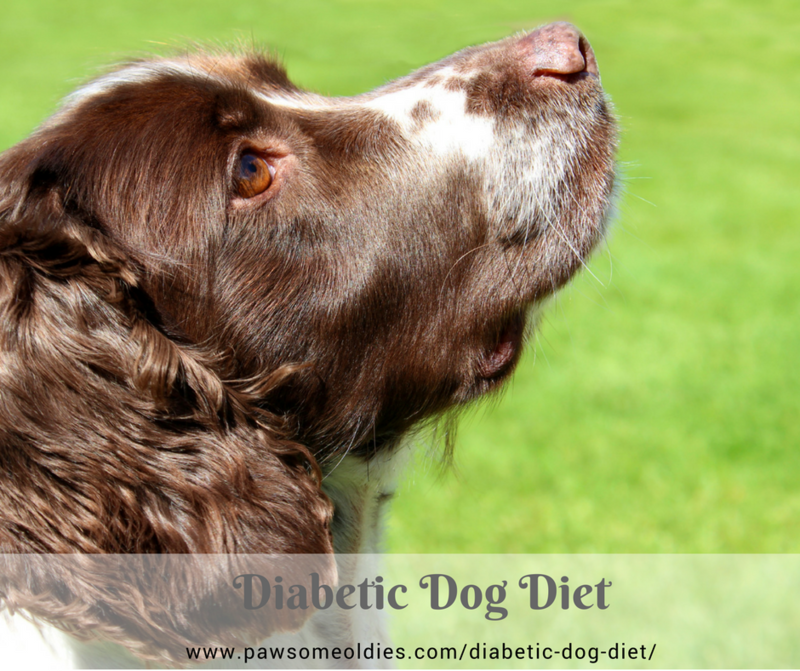 What Constitutes a Good Diabetic Dog Diet? Like all dog diets, a diabetic dog diet should be nutritionally complete and balanced. In addition, it should have consistent proportion of carbohydrates, fat, and protein. A diabetic dog diet should not restrict protein intake, but instead should contain moderate amount of high-quality protein. If you use a commercial dog food, make sure that the first 2-3 ingredients contain at least one named animal protein source (e.g. lamb meat, chicken meal, salmon meal, etc.). Fat should be moderately restricted, especially if the dog is overweight (which is common in diabetic dogs) or is prone to pancreatitis. As a general rule of thumb, fat should be less than 20% of the total calorie intake. Make sure, however, that there are good levels of essential fatty acids (Omega-3s). A diabetic dog diet should be low in simple carbohydrates (sugars, such as corn syrup), but can contain complex carbohydrates (around 30% of total calorie intake). Complex carbs have lower glycemic index levels because they are more slowly digested and absorbed than simple carbs. Highly digestible diets can cause higher blood sugar levels after eating, so they may not be ideal for diabetic dogs. Dogs with diabetes can benefit from a diet that contains moderate levels of dietary fiber, which form the indigestible portion of plant foods. Fiber can be soluble (e.g. psyllium, guar gum, lactulose) and insoluble (e.g. cellulose, bran). According to one school of theory, the most effective way to help sugar absorption and decrease fluctuation in blood sugar levels after meals is to have both soluble and insoluble fiber in the diet. Glycemic index measures the effects of carbohydrates on blood sugar levels. Foods with low glycemic index release glucose slowly and steadily, whereas foods with high glycemic index can spike blood sugar levels more quickly. Carbohydrates are largely responsible for changes in blood sugar levels after meal. So, keeping the amount of carbohydrates in the dog diet steady is the best way to keep the insulin needs stable. If your older dog is overweight and you need to reduce the fat content in her diet, do not increase the carbohydrate content to compensate for the calories. Instead, increase the protein content. Feed your dog the same amount of food at the same time every day. Preferably feed her twice a day 12 hours apart. 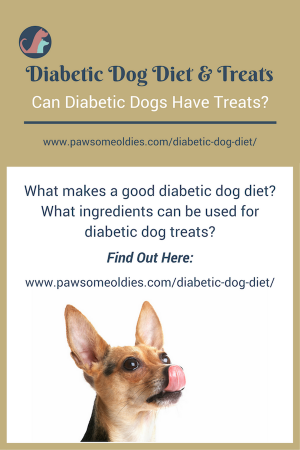 Can We Give Treats to Diabetic Dogs? Many diabetic dog parents wonder if their dogs can have treats, and if so, whether special diabetic dog treats should be given. Treats can act as blood sugar stabilizers, especially after exercising. Treats can also act as rewards for the daily needle. Dogs with diabetes have to go through the discomfort of insulin injections every day, and most dogs are used to getting daily treats. Imagine how a dog feels if treats are taken away from his daily routine! Stressed I would think, and he may also feel that he is being punished for no reason. 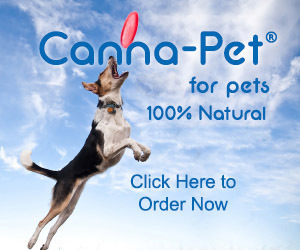 Diabetic dogs can enjoy healthy natural treats just like other dogs do. Just remember the treats should not be more than 10% of their total calorie intake. It is a good idea to give your dog a small treat after insulin injection to make the daily injection routine a more positive experience for your dog. You may also want to break up the treats into smaller pieces (or if you make your own dog treats, make them smaller), and give the pieces to your dog throughout the day. white sugar, brown sugar, cane sugar, etc. syrup – corn, malt, maple, etc. sweetened peanut butter, apple sauce, etc. A treat that contains a named animal protein source is good for diabetic dogs (it’s good for all dogs! ), e.g. chicken jerky, beef liver treats, etc. Treats that contain complex carbs (e.g. 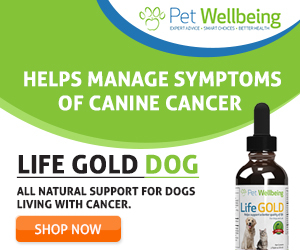 whole oats, barley, sweet potatoes, green peas, green vegetables) are also suitable for diabetic dogs.